Although the last couple of movies lacked this feature, Blood starts with a staple of the first few sequels: a recap of the prior effort. We see the ending of Jason Lives to witness how murderous monster Jason Voorhees (Kane Hodder) ended up at the bottom of Crystal Lake. A little girl named Tina Shepard (Jennifer Banko) wishes for the death of her abusive father John (John Otrin). This sets events into motion that collapse the pier on which he stands and apparently kills him. Actually, the series went to crap when it totally lost touch with reality. No, the flicks never maintained a perfect connection with the real world, especially as Jason’s abject refusal to die became more and more absurd. I guess the movies excuse this by calling him a zombie; I don’t recall that the flicks ever explicitly stated this, but they follow that concept. 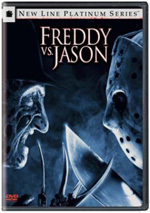 I will admit that Blood had some potential, mainly because it was the first Friday flick to offer a character with the apparent ability to battle Jason as an equal. This isn’t just another teen with ineffectual weapons. Tina’s psychic abilities mean that she can fight Jason in a meaningful manner. With each new movie, it becomes more and more absurd that people are willing to hang out at Crystal Lake. How stupid are these people? The films try to eliminate this problem as they communicate that people regard Jason as an urban legend. How is this possible? Even if no one believes in the Jason bogeyman, all the killings are a matter of record. I think a tourist trap with so much blood on the ground would be an awfully tough sell, but each movie brings more and more teens back to the killing grounds. While Blood attempts more character definition than the first couple of flicks, the personalities remain one-dimensional at best. Much of the problem with this movie comes from the lead role of Tina. She’s genuinely screechy and annoying, which makes her one of those participants we Jason will kill. The New Blood continues a Friday the 13th trend that takes the movies farther and farther from what made the series successful. It seems desperate to shake things up but it lacks much to make it worthwhile. It’s one of the less interesting of the Friday flicks. Friday the 13th Part VII: The New Blood appears in an aspect ratio of approximately 1.85:1 on this single-sided, double-layered DVD; the image has been enhanced for 16X9 televisions. Although it didn’t look quite as good as Part VI, the picture for Blood seemed more than satisfactory overall. Sharpness was positive. A smidgen of softness occasionally interfered with wide shots, but those issues remained minor. Instead, the movie usually appeared distinctive and detailed. The image suffered from no problems with jagged edges or shimmering, and it also lacked edge enhancement. Grain seemed a little heavier than usual, and I noticed occasional examples of specks, but the source mainly was clean. Colors came across as very good. The film utilized a fairly broad palette, and the DVD replicated those tones with accuracy and vivacity. The hues always were concise and firm. Blacks seemed similarly tight, but shadows tended to be slightly dense. Low-light shots remained adequate but could be a little bland. Nonetheless, the image was quite positive as a whole. Of the series’ first eight films, only The New Blood boasted a Dolby Digital 5.1 soundtrack. (The first five were mono while VI and VIII used “Ultra Stereo”.) Despite the slight expansion in audio capabilities, the mix seemed very similar to that of Part VI. The soundfield stayed with a forward bias. In that realm, elements were accurately placed and meshed together pretty nicely. The music demonstrated fine stereo presence and the effects helped create a good feeling of atmosphere. The surrounds largely just reinforced matters and didn’t add much unique audio, but they managed to bring nice support to the track. 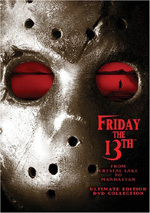 This version of Friday the 13th Part VII comes as part of a package entitled From Crystal Lake to Manhattan - Ultimate Edition DVD Collection. It gathers the first eight Friday flicks onto four discs and adds a fifth platter of supplements. Four of the flicks include commentaries that I’ll discuss when I get to those movies. Since Paramount designed the set as a connected package, I didn’t give the individual discs grades for supplements; I’ll reserve those for an overall review of the fifth DVD. Half of the eight movies include no supplements, but Part VII comes with an audio commentary. We hear from director John Carl Buechler and actor Kane Hodder, both of whom sit together for their running, screen-specific chat. Hodder doesn’t offer much real information. He tells us some notes about how he got the part and life under the mask, with an emphasis on the logistical issues as well as his acting choices. However, Buechler dominates as he goes over casting, sets and locations, staging the kills and stunts, and cut material. The latter remains a particular sore spot, as Buechler continues to feel upset about the deletions forced on him for ratings reasons. The commentary fares best in its first half, but it tends to drag during the movie’s second part. Friday fans will still probably learn a fair amount from this track, but it’s too spotty to be better than average. Although Friday the 13th Part VII: The New Blood attempts to do something different with the stodgy franchise, it fails to prosper. Its stabs at creativity become ridiculous and the movie is way too absurd to work. The DVD offers very good picture and audio, however, as well as a decent but inconsistent audio commentary. This disc presents the movie in a high quality way, so that should satisfy its fans. I can’t imagine why anyway would enjoy this inane flick, but I can’t complain about the DVD’s execution.